1) A situação é grave, muito mais grave do aquilo que chega aqui pela mídia generalizada. Kiev virou realmente um campo de batalha, um campo de batalha na cidade que simbolicamente é o berço do mundo eslavo; um campo de batalha em um país europeu, quando muitos europeus acreditavam que isso só poderia acontecer na periferia do mundo civilizado. “Ok”, podem dizer os mais cínicos, “mas a Ucrânia não seria assim tão européia…” É exatamente esse um dos aspectos centrais dos dilemas daquele povo, e tem gente morrendo por isso. 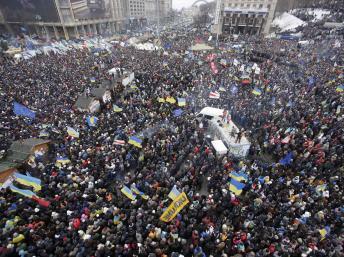 2) Muita gente está morrendo em Kiev por ocasião dos protestos, começados há alguns meses e agravados agora. O uso do gerúndio aqui foi proposital: pessoas continuam sendo alvejadas nas ruas, hospitais lotados de feridos, filhos que não voltam para casa, famílias que perdem o pai… Se os brasileiros se chocam tanto com a violência dos protestos por aqui, deveriam ter mais consciência de que as mortes na capital ucraniana, em razão dos confrontos e das manifestações, chegam a centenas. 3) Sim, a Ucrânia é um país dividido. Sempre foi. Metade da população fala russo, vem de uma cultura eminentemente russa, tem vínculos estreitos com a Rússia, e não se ofenderia em ver seu país tornando-se mais uma das repúblicas da Federação comandada a partir de Moscou. Uma outra parte é de ucranianos, que tentam de todas as maneiras a afirmação de seu idioma, sua cultura e sua nacionalidade, vendo a aproximação com a União Européia a esperança de libertação da hegemonia russa – essa aproximação, defendem, é uma questão de sobrevivência para o país, cuja a história foi em sua maior parte de ocupação e dominação por uma potência estrangeira. E ainda existem aqueles de origem polonesa, romena, tártara, que ficam no meio do fogo-cruzado… Ou seja, o que se vê no país agora não são protestos contra um governo, mas uma crise de identidade nacional e uma disputa decisiva pelos destinos da Ucrânia nas próximas décadas. 4) Por sua posição estratégica, fica evidente que a disputa na Ucrânia ultrapassa os interesses dos próprios ucranianos. Trata-se, de fato, de uma confrontação entre o Ocidente e a Rússia, que se reergue da queda soviética. A Ucrânia é, tradicionalmente, zona de influência direta russo-soviética, é importante para Moscou, e Putin não abrirá mão tão fácil do segundo maior país eslavo, tanto por essa condição quanto por seu valor econômico e político. Das ex-repúblicas soviéticas, a Ucrânia, é o país mais estratégico e geopoliticamente importante para os russos. Que não seja desconsiderada uma intervenção militar direta de Moscou em socorro a Yanucovich. A Ucrânia não é, de forma alguma, a Geórgia. 5) O destino da Ucrânia repousa nas mãos de seus cidadãos, sem dúvida. Mas a disputa internacional não pode ser desconsiderada. E nessa queda de braço entre ocidentais e russos, convém observar atentamente quem cede primeiro. Putin não costuma ceder. 6) Algumas mudanças políticas importantes parecem ocorrer nas últimas horas (escrevo no sábado, 22/02, pela manhã, a partir de Brasília): Yulia Timoshenko, ex-primeira ministra e opositora do regime, seria libertada por força de uma decisão do Parlamento (sim, ali, com a herança autoritária soviética, opositores do regime são presos, e presos políticos existem, presos políticos de verdade e não criminosos que em outras partes do mundo erguem o braço para ser dizer perseguidos políticos e são aplaudidos por mentecaptos comprados com ideologia e fé cega ou, simplesmente, com dinheiro mesmo). Yanucovich parece ter deixado a capital e haveria rumores de sua renúncia, parece… A questão é quem fica em seu lugar… E se já teriam negociado isso com os russos. KIEV (Reuters) – Protesters seized the Kiev office of President Viktor Yanukovich on Saturday and his whereabouts were a mystery, as the pro-Russian leader’s grip on power rapidly eroded following bloodshed in the Ukrainian capital. Parliament voted to free his arch-rival, jailed former prime minister Yulia Tymoshenko. Her daughter said Tymoshenko was already free under Ukrainian law but still in the hospital where she has been held for treatment. 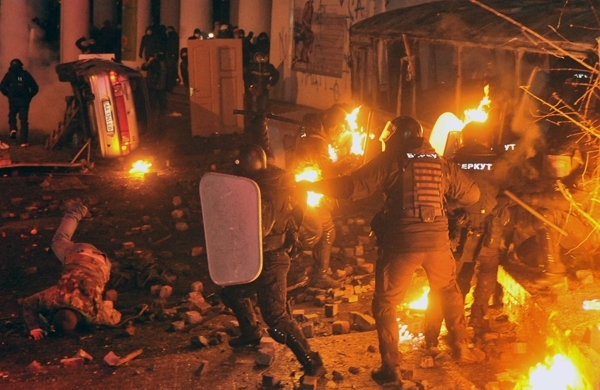 The newly-installed interior minister declared that the police were now behind the protesters they had fought for days, giving central Kiev the look of a war zone with 77 people killed, while central authority crumbled in western Ukraine. The grounds of Yanukovich’s residence outside Kiev were also being guarded by “self-defense” militia of protesters. The quick disintegration of Yanukovich’s government marked a setback for Russian President Vladimir Putin, who had counted on the Ukrainian leader to bring Ukraine into a Eurasian Union to help rebuild as much of the old Soviet Union as possible. A senior security source said Yanukovich was still in Ukraine but was unable to say whether he was in Kiev. An ally was quoted as saying he was in a city in the country’s generally pro-Russian east. The government, still led by a Yanukovich ally, said it would ensure a smooth handover of power to a new administration. Yanukovich, who enraged much of the population by turning away from the European Union to cultivate closer relations with Russia three months ago, made sweeping concessions in a deal brokered by European diplomats on Friday after days of pitched fighting in Kiev, with police snipers gunning down protesters. 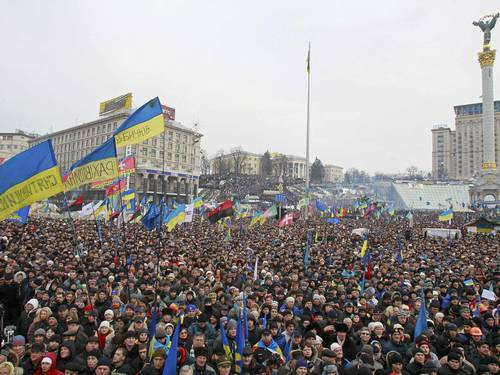 But the deal, which called for early elections by the end of the year, was not enough to satisfy demonstrators, who want Yanukovich out immediately in the wake of the bloodletting. Parliament has quickly acted to implement the deal, voting to restore a constitution that curbs the president’s powers and to change the legal code to allow Tymoshenko to go free. On Saturday, lawmakers voted to speed her release by eliminating a requirement that the president approve it. The speaker of parliament, a Yanukovich loyalist, resigned and parliament elected Oleksander Turchynov, a close ally of Tymoshenko, as his replacement. Events were moving at a rapid pace that could see a decisive shift in the future of a country of 46 million people away from Moscow’s orbit and closer to the West, although Ukraine is near bankruptcy and depends on promised Russian aid to pay its bills. “Today he left the capital,” opposition leader Vitaly Klitschko, a retired world heavyweight boxing champion, told an emergency session of parliament about the president. The UNIAN news agency cited Anna Herman, a lawmaker close to Yanukovich, as saying the president was in the northeastern city of Kharkiv, in a mainly Russian-speaking province. The release of Tymoshenko would transform Ukraine by giving the opposition a single leader and potential future president, although Klitschko and others also have claims. She was jailed by a court under Yanukovich over a natural gas deal with Russia she arranged while serving as premier. The European Union had long considered her a political prisoner, and her freedom was one of the main demands it had for closer ties with Ukraine during years of negotiations that ended when Yanukovich abruptly turned towards Moscow in November. “According to Ukrainian law my mum is already a free person,” daughter Yevgenia Tymoshenko told reporters, saying she was on her way to meet her mother in Kharkiv where she has been held in hospital under treatment for back pain. A spokeswoman for the former prime minister, 53, said that although the moves in parliament already made her a free woman, Tymoshenko had not yet been released or left the hospital. In a sign of the quick transformation, the interior ministry responsible for the police swung behind the protests. It said it served “exclusively the Ukrainian people and fully shares their strong desire for speedy change”. However, underscoring Ukraine’s regional and ethnic divisions, leaders of Russian-speaking eastern provinces voted to challenge anti-Yanukovich steps by the central parliament. Eastern regional bosses meeting in Kharkiv adopted a resolution saying parliament’s moves “in such circumstances cause doubts about their … legitimacy and legality. Yanukovich’s broad concessions on Friday ended 48 hours of violence that had turned the center of Kiev into an inferno of blazing barricades. Without enough loyal police to restore order, the authorities had resorted to placing snipers on rooftops who shot demonstrators in the head and neck. “We joined the talks later, which wasn’t very right,” Russian envoy Vladimir Lukin was quoted as saying by Interfax. With borders drawn up by Bolshevik commissars, Ukraine has faced an identity crisis since independence. It fuses territory integral to Russia since the Middle Ages with former parts of Poland and Austria annexed by the Soviets in the 20th century. In the country’s east, most people speak Russian. In the west, most speak Ukrainian and many despise Moscow. Successive governments have sought closer relations with the European Union but have been unable to wean their heavy Soviet-era industry off dependence on cheap Russian gas. The past week saw central state authority vanish altogether in the west, where anti-Russian demonstrators seized government buildings and police fled. 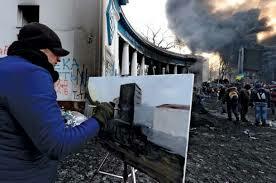 Deaths in Kiev cost Yanukovich the support of wealthy industrialists who previously backed him. Putin had offered Kiev $15 billion in aid after Yanukovich spurned an EU trade pact in November for closer ties with Moscow. The fate of those funds is now unclear. Washington, which shares Europe’s aim of luring Ukraine towards the West, took a back seat in the final phase of negotiations, its absence noteworthy after a senior U.S. official was recorded using an expletive to disparage EU diplomacy on an unsecured telephone line last month. 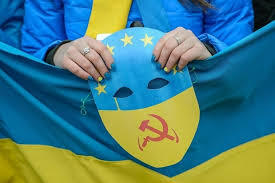 Esse post foi publicado em EUA, Guerra, História, Rússia/União Soviética, Segurança e Defesa, Um pouco de tudo, União Européia e marcado crise ucrania, Kiev, protestos Kiev, protestos ucrania, Putin, ruas Kiev, Timoschenko, Ucrania, Yanucovich por Joanisval. Guardar link permanente. Bela matéria e boas ponderações. Oportuna e antenada os acontecimentos, quase ao vivo, o post mais que nos informa, nos faz refletir sobre o nível e amadurecimento político de um povo. Até onde vai suas convicções e quanto tempo mais vamos precisar no Brasil para brigarmos com um décimo de paixão por nossa própria e real independência. Parabenizo aqui o autor e amigo pela contribuições que vem nos brindando através do Frumentarius. Tem sido sempre excelente leitura: ampla no limite da oportunidade, clara, objetiva e com viés diferenciado do que lemos na imprensa sensacionalista. Muito obrigado, Tarcísio Jr., pelas gentis palavras! Forte abraço!